Raymond Weil adds to its musical repertoire in 2017 with several new tuneful horological compositions. 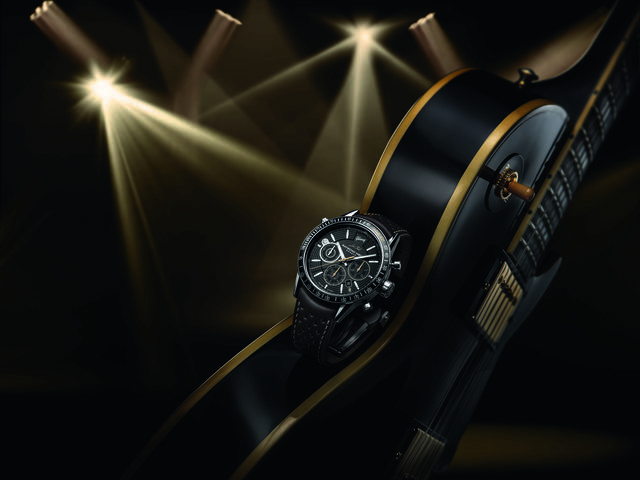 Long dedicated to celebrating its love of all types of music, the Geneva-based brand just a few weeks ago announced its expanded partnership with U.S.-based guitar-maker Gibson, while this week at Baselworld the brand adds two musical-themed Maestro models. One new Maestro is dedicated to the memory of Buddy Holly, one to David Bowie and the other expands the Beatles-themed collection first seen last year. The Beatles Maestro collection, which debuted last year with a watch that featured all Beatles album titles emblazoned around the dial, this year offers a watch with a more nuanced design. 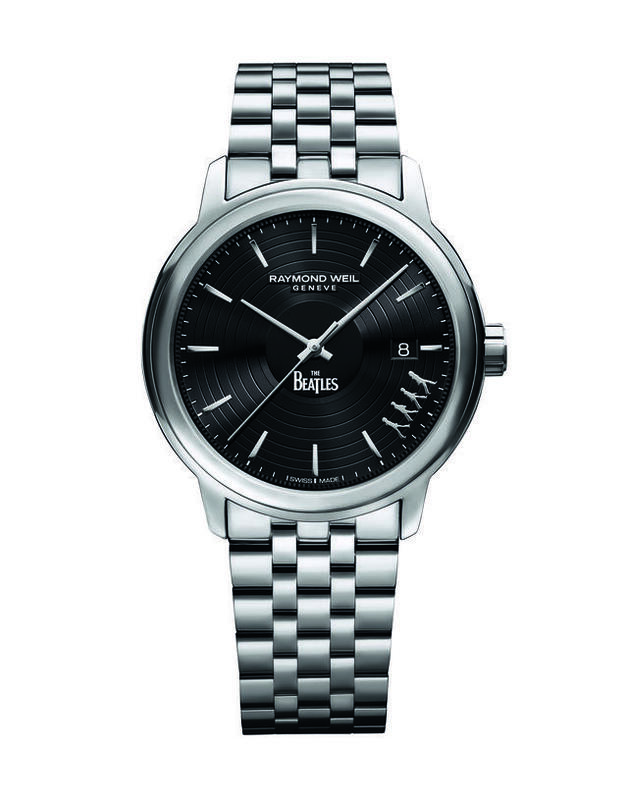 The 39.5mm steel edition (with steel bracelet) features a black dial etched to resemble a vinyl album and with the four Beatles representing the 4 o’clock position. A smoky sapphire caseback will reveal a Sellita-based automatic movement. Price: $1,395. 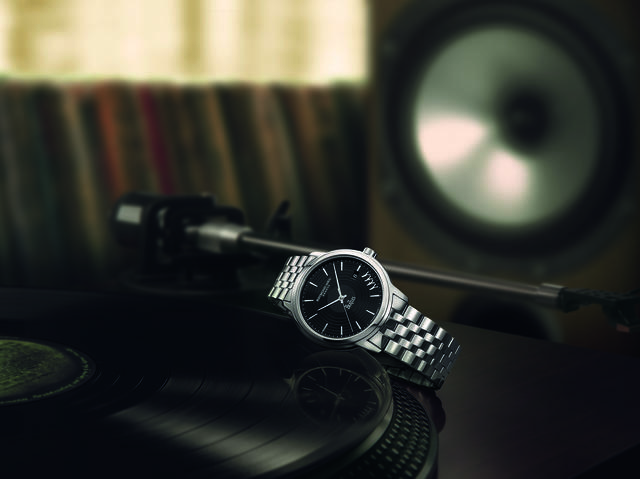 Just prior to Baselworld Raymond Weil introduced the year’s other 39.5mm Maestro watch homage to early rock and roll music: a special 80th anniversary tribute to Buddy Holly. The watch, sold with a steel bracelet, has been designed in partnership with Maria Elena Holly, the widow of Holly, and it features the musician’s favorite number (9), favorite color (power blue) and his heavy rimmed black glasses, seen on the end of the separate seconds hand. Inside is a Sellita-based automatic RW4250 with a 38-hour power reserve. 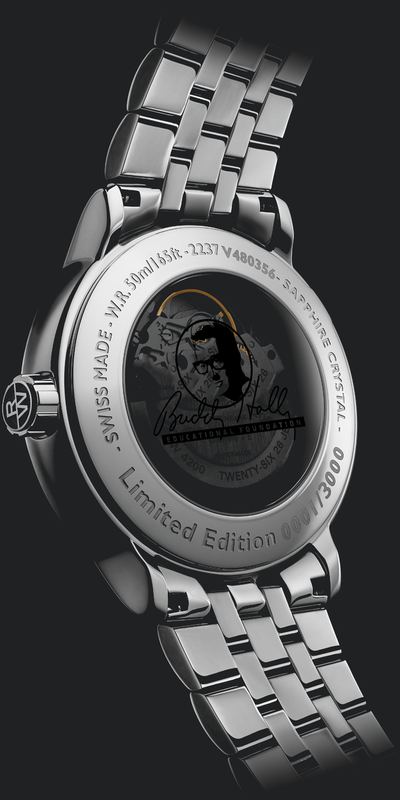 The automatic movement is visible through the smoked sapphire glass caseback, which bears the logo of the Buddy Holly Educational Foundation. Raymond Weil will contribute a portion of the sale of each watch to the foundation, a charity that funds the musical education of young people. Three thousand will be made. Also new is a special tribute to David Bowie, a collaboration with the David Bowie Estate. The Freelancer David Bowie watch honor the influential musician in time for what would have been his 70th birthday. The watch’s 42mm case features a dial with grooves that mimic a vinyl record, plus the red lightning bolt from the cover of his 1973 album, Aladdin Sane, and the red Bowie logo from the Diamond Dogs album from 1974. The 3,000-piece, limited and numbered series of automatic watches also feature a portrait of David Bowie on its sapphire caseback as shot by photographer Terry O’Neill. 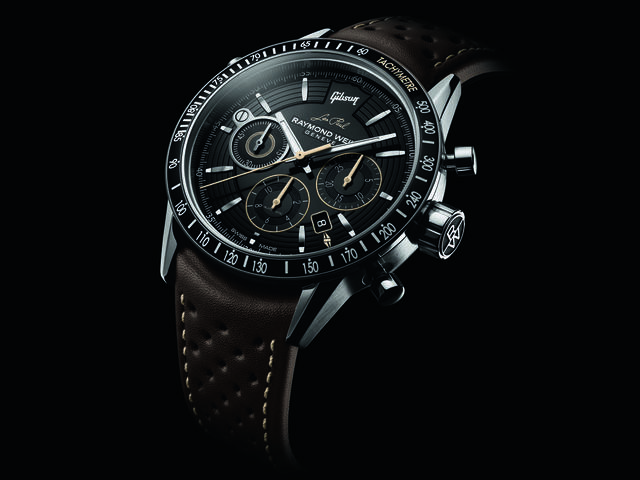 The Raymond Weil Freelancer Chronograph Tribute to Les Paul honors guitar designer and legendary player Lester William Polsfuss, known as Les Paul, by depicting many of the visual cues that make the Gibson Les Paul guitar the choice of rockers like Jimmy Page, Keith Richards, Jimi Hendrix, Eric Clapton and so many others. 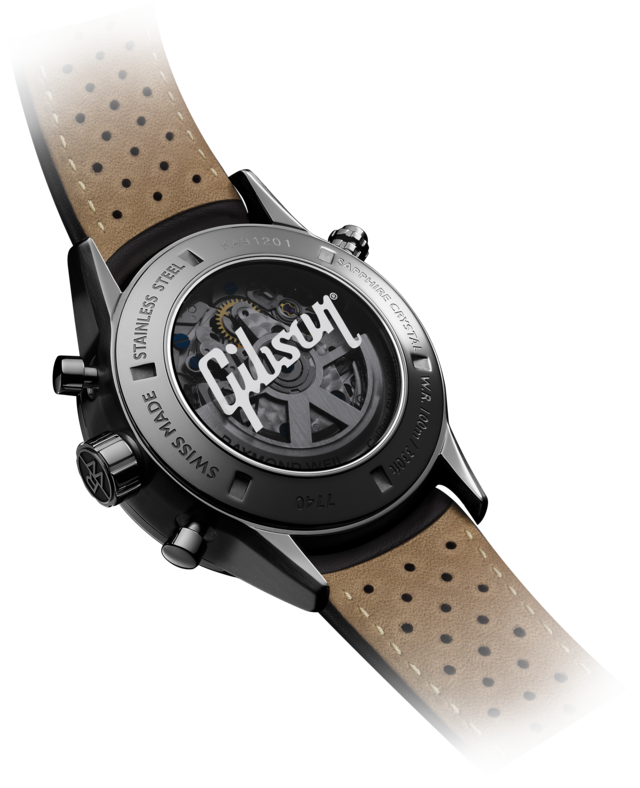 The new Les Paul watch is a 43.5mm steel-cased limited edition (200 pieces) with a black PVD tachymeter bezel directly inspired by the lacquer on the Gibson Black Beauty guitar. 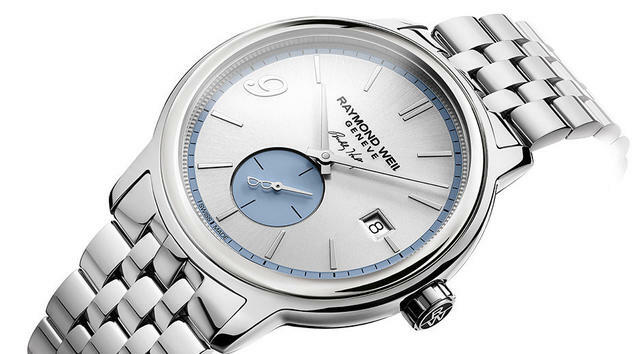 The dial features a circular guilloché design featuring six chords studded by fret-shaped hour markers. At 12 o’clock, ‘Gibson’ appears, just above Les Paul’s signature appear, while the split-diamond inlay (also a feature of the Les Paul Custom guitar) can be seen next to the date window. Furthermore, the watch’s tri-compax chronograph counters, date and strap topstitching are also inspired by the Gibson Les Paul, and are thus set with golden highlights. The Freelancer’s perforated black calf leather strap is designed to recall guitar sound holes. Inside ticks an ETA 7753 automatic chronograph Raymond Weil reworks to create Caliber RW5010.